Discover the Very Cool World of CSS Sprites! If you want your website to ooze with that "WOW" factor everyone strives for (but most miss) ...if you want your website to create a positively GREAT first impression ...then you should use CSS Sprites instead of those boring old do-nothing link buttons! What are CSS Sprites? Just rest your cursor on one of the example link buttons below to see. Drag your cursor up and down one of the columns of buttons. Click one of the links to see the change of state. Each set is different—try them all if you want! Those cool looking buttons are just the tip of the iceberg ... just imagine your site having such a cool navigation system! Let's be realistic here ... do-nothing static link buttons are so 1990's they are a complete bore. It's time to evolve! CSS Sprites are MEGA cool visual enhancements that actually do more than just look cool. Search Engine Benefit. Sprites help your web pages to load faster than using regular link buttons by reducing the number of HTTP requests required to load the page. Load time is a factor in search engine rankings, so faster is better. Better Stick Rate. And, because your web pages load faster, you won't have people click their browser's back-button as often because they grow impatient waiting for the page to load. Your website's "stick rate" will improve. Search Engine Benefit. If people click back to the search engine too fast (called the bounce rate) the search engine will lower your page's search engine ranking. Faster pages keep the bounce rate lower so your site isn't penalized. Search Engine Benefit. Search engines can't read text on most graphic buttons so there is no benefit in using them. Using sprites the way I show you, the search engines CAN and DO read the text so they ARE search engine friendly and can HELP your site's ranking. Compatibility. Works in all modern browsers and many older browsers too. In really old browsers they just look like regular static buttons, and the number of people using browsers that old is extremely small. Reusable. A single sprite image can be used to display dozens, hundreds, or even thousands of link buttons—all having the exact text you decide each button should have. Now that is maximum efficiency! Easier to Make Changes. If you want to redesign your site you can replace all your link buttons by just changing one image if you use sprites. The old way, using a unique image for each button, you'd have to remake every button. Easy to Use. For all the advantage of using sprites, the fact that they are easy to use only adds to many reasons you should be using sprites on your website. The Awesome Coolness Factor. 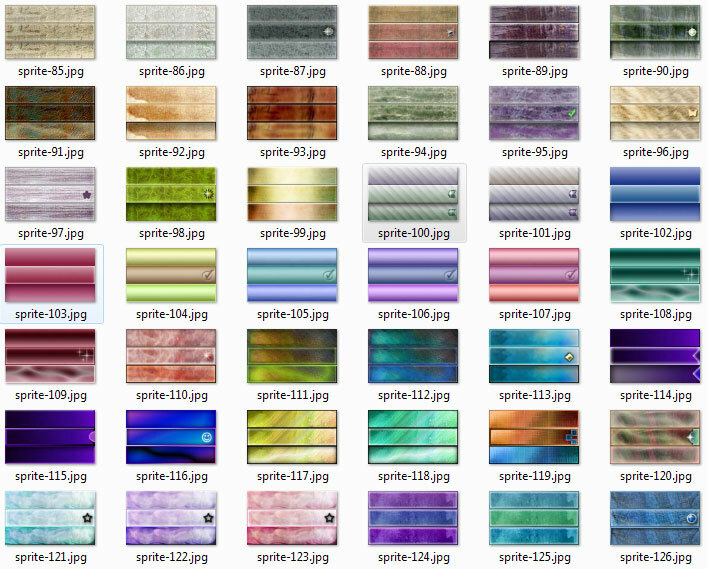 Did I mention sprites are way cool? Your site will look better and perform better—and since sprites are very professional looking, they can help increase your website's credibility and your authority. This is professional grade cool. 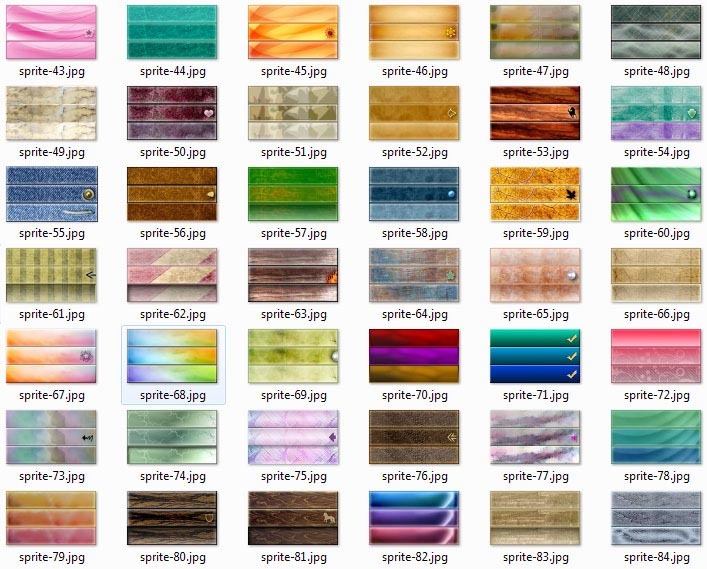 With 234 sprites to choose from you're sure to find a lot to love. There are textured sprites, smooth gradients, wood looks, watercolor and more ... there's even a denim button that shows a rivet when the cursor is on it and a tear when clicked. From understated sprites to boldly colorful, you'll love the choices! The one problem with sprites is that most webmasters don't understand them and don't know how to use them. That problem is SOLVED! A 9-page PDF document with three different sprites tutorials in plain English. You can even copy and paste code right from the PDF document. 234 sprite buttons you can add your own link text to — the button examples on this page are from this kit. The text is added with HTML ... no graphics editing experience needed! Free developer's license included! Use the sprites on all your sites, on sites you design for others, and on sites you build to sell. Free upgrades for 1 year! 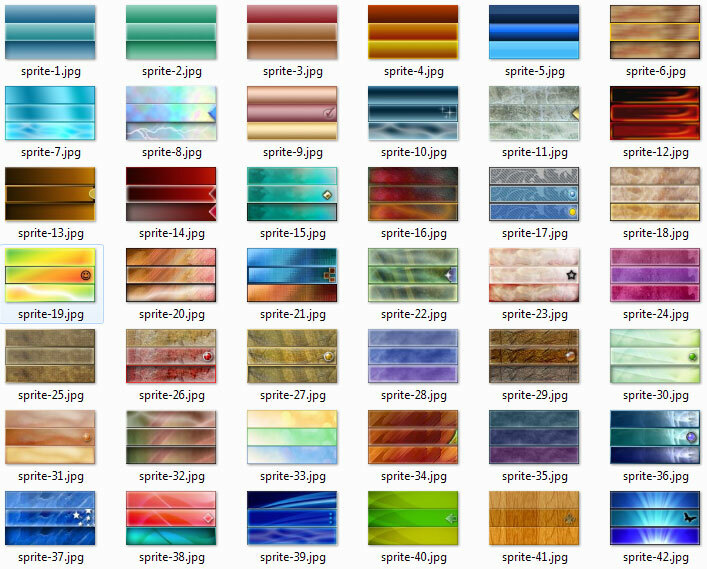 I do have plans to add different kinds of sprites to this kit, along with the related tutorials. That's a little ways down the road, but you should get at least one free upgrade, and maybe more. Join Thousands of Smart Webmasters! By using sprites on your site you'll join thousands of other webmasters who were smart enough to realize the improved efficiency and functionality, plus the good looks, search engine benefits and the undeniable cool factor are just too good to pass up. There's something for everyone in this collection. You'll probably have a hard time choosing which ones to use! Just imagine how cool your website will be with these show-stoppers! You'll get emails from people telling you how cool your navigation buttons are. Some will want to know how you did it. You can tell them, or you can keep it our little secret. Either way, they'll think you're cool. Trust me on this—it's FUN getting email from admirers singing your praises! That could happen to you, too! 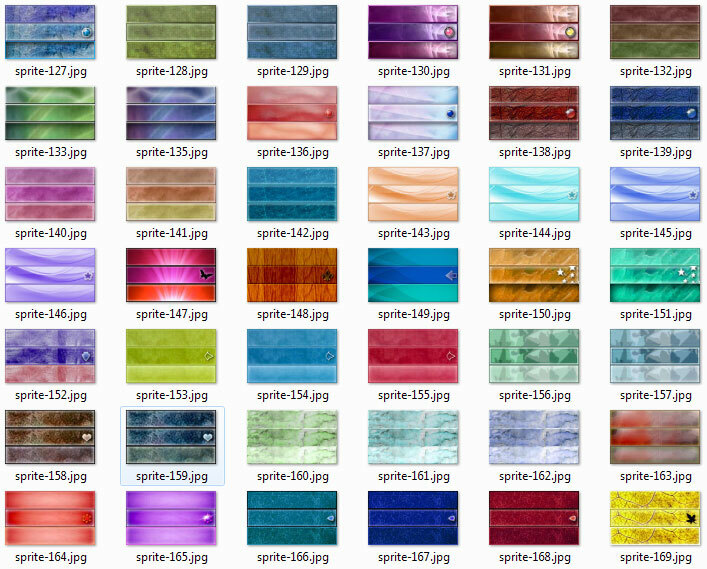 You'll find the collection of sprites in this kit displayed below. The image sheets below do not show the sprites at full size. A full-sized example is to the right ... just the right size for buttons, but you can resize them if you need to. 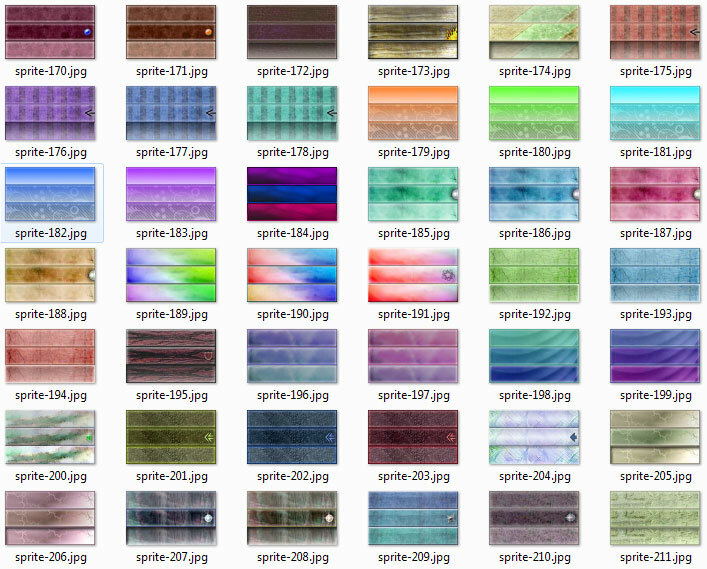 Yes, you get ALL THOSE SPRITES! You get all those sprites, plus the easy-to-understand tutorials, a free developer's license and free upgrades for one year! Friendly tip: Order today to ensure you get everything at the very lowest price, because after I pack even more goodies into this sprites kit I will probably raise the price. Yes, this looks great! Finally an EASY way to add real style and flair to my website like the pros! 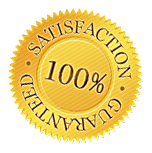 I understand I'll get immediate access to download the product, and that I also get a 30-day money-back guarantee AND free upgrades for one full year! Just $17.00 if you order now! Instant Download! Click there to get started right now! P.S. Remember, you'll get FREE upgrades for one year, so all the goodies I add to the sprites kit will be yours for the next year at no additional cost to you!